During his lengthy stay with the armies of Marchall Soult, where he needed to perform a great deal of calculations, Charles-Xavier Thomas de Colmar (see biography of Thomas de Colmar) conceived the idea of the arithmometer. This became even more important in his eyes when, in 1819, he was appointed General Manager of the Phoenix insurance company and, later, when he founded the insurance companies Soleil (Sun) and Aigle (Eagle). 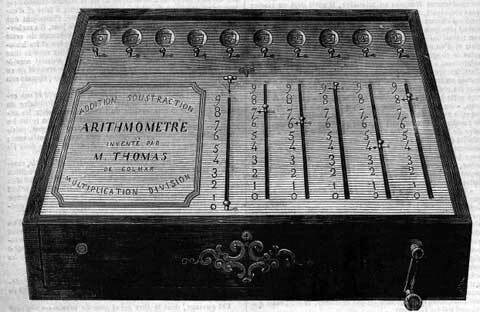 Thomas’s arithmometer was first made public in 1820 when he was granted a five year patent for his calculating machine (see the drawing below). The mechanism was based on the stepped drum mechanism of Leibniz. It is clear however that the patent represents only a transient prototype, on which Thomas was still actively working. By 1821, when he was ready to submit an example to the scrutiny of the Société d’encouragement pour l’industrie nationale, the design had already moved on significantly. In 1821 Thomas de Colmar submitted to the Sociėtė d'Encouragement... in Paris the first copy of calculating machine he had constructed (which he called an arithmometer), manufactured by the Parisian mécanicien and clockmaker, Devrine. From 1822, when the production started, until 1878, were manufactured about 1500 machines, as last models cost 500 franks, a serious sum for this time. In his promotional book of 1855 however, Jacomy-Régnier announced that Thomas had spent 300000 francs on developing the arithmometer, setting that figure against Leibniz’s reputed costs of 100000 francs and Babbage’s notorious government subvention of £17000 (reckoned as equivalent to 425,000 francs). Admittedly, Thomas’s work on the arithmometer is more likely to fall within the category of vanity publishing, than profit and mass production. The series production started really only about 1851 and finished around 1914. As we know, the Thomas workshop completed five hundred machines from 1821 to 1865, three hundred machines from 1865 to 1870, four hundred machines from 1871 to 1875, and three hundred machines from 1876 to 1878. More than 5000 specimens of the Calculating machine were manufactured during these 90 years, 40% of the production were sold in France and the remainder was intended for export. In fact, up to the time when the calculating machine industry was introduced into Germany by Arthur Burkhardt (1878), the Thomas' workshop was the only firm in this line and supplied the whole world with its products. The 1820 machine had a ribbon to pull (instead of a crank as later models), a second set of result display for subtraction and division and (most important)—a multiplication gear, set by the first slider from left, which allowed the "multiple add" by one "pull" and actually shows the number of the revolutions of the calculating mechanism. It has capacity of 3 digits in the input mechanism and 6 digits in the result mechanism. It has only clearance of the single result digits. In the second model of 1848 (see the photo below), the complex and unreliable movement mechanism with ribbon was replaced by a crank at the front side, which can be rotated in two directions so many times, according to the value of the particular digit in the multiplier/divisor. It still has the multiplication gear. The second set of result displays is gone, the switch from addition and multiplication to subtraction and division was done by a lever. Internally, the stepped drum was reduced from 18 to 9 teeth. The capacity was increased to 5 digits in the input mechanism and 10 digits in the result mechanism. Every digital position is shown in one windows already, because switching between multiplication and division was done by means of the lever (placed to the left of the multiplication lever), which changed the direction of the carry from the calculating to the result mechanism. In the third version of the machine from 1858 the main improvement was the second counting mechanism without a tens-carry (revolution counting mechanism), which simplifies multiplication/division. The machine was also provided with one zero-setting device that acted on all the windows of the result mechanism and another for all the windows of the revolution-counting mechanism. Previously, all the numeral disks had to be set to zero individually by turning knobs placed below the individual windows. The zero-setting device is in the form of a rotating knob that is turned to the right until all the windows of the respective numeral mechanisms show zero. The zero-setting device of the result mechanism is mounted on the right side of the upper surface of the carriage, whereas the zero-setting mechanism of the revolution-counting register is arranged at the left. In the forth model of 1878 the setting slides were provided with small springs, which, when the slide has been set to a certain digit, cause the slide to slip into a notch opposite that digit so that an accidental movement of the setting knob during operation of the crank is avoided. The tens-carry mechanism was materially improved. Means were provided to prevent overthrow. Capacity of the model is 10 x 11 x 20. The machine presents two principal parts (see the drawing below), a fixed setting plate with a series of sliders for inputting numbers (marked with A), and a movable carriage where results appear (M). The number, set with the sliders, is mechanically transferred to the result dials on the carriage (C) by turning the handle (N). This transfer operation, basic to all the arithmometer’s workings, is accomplished using the stepped cylinders of Leibniz. Each cylinder carries 9 teeth whose length increases stepwise (see the drawing below) (marked with A). The cylinder’s teeth engage a pinion (B), whose position is controlled by the setting slider (C). The higher the number set by the slider, the larger the number of teeth on the cylinder engaging the pinion. When the handle is turned the cylinder rotates and as a result the pinion’s square arbor (F) is turned through an arc proportional to the value set on the slider. It is this rotation which is communicated to the result dial (K) via a bevel wheel (G). One turn of the handle adds the value set on the sliders to the result dials and, since multiplication is simply repeated addition, turning the handle, say, 8 times multiplies the given number by 8. To multiply by 38 it is not necessary to turn the handle 38 times. Rather, after turning it 8 times, the carriage is moved one step to the right and the handle then turned 3 times. Using the reversing switch on the setting plate (upper figure, B), the machine can be set to perform subtraction and division. The lower figure shows the result of pushing the switch: M slides forward, disengaging the bevel wheel G from I (on the axis of the result dial K) and bringing H into contact with I. Now when a turn of the handle causes arbor F to turn, I—and thus the result dial rotates in the opposite direction, reducing rather than increasing the displayed value. A turn of the handle thus subtracts the number set on the sliders from a number entered on the result dials. As multiplication is repeated addition, so division is repeated subtraction, with the quotient appearing in the smaller set of dials on the carriage (upper figure, D). These quotient dials are simply counters: each turn of the handle increments the dial currently in contact with the counting mechanism by one unit. The quotient dials are also useful in multiplication, since they provide a visual check on the value of the multiplier. Finally, when a calculation is complete, the carriage dials can be reset to zero: each set of dials has an independent zeroing mechanism operated by twisting one of the two knurled knobs at either end of the carriage (upper figure O and P). Thomas first ventured into the world of exhibitions when the arithmometer was revived in 1844. A machine was entered in the French national exhibition of industrial products where it was classed amongst precision instruments in a category of diverse measures, counters and calculating machines. If Thomas had hoped for substantial recognition and reward, he was to be disappointed. The arithmometer was granted an honorable mention in the jury report but was clearly considered inferior to the submission of the Austrian emigré doctor Didier Roth, who obtained a bronze medal for his adding and calculating machines and counters. The judgment of the 1844 jury was mirrored in the coverage given to Roth in a separate guide to the exhibition’s highlights, in which Roth’s adding machine was described and illustrated, while the arithmometer was ignored. 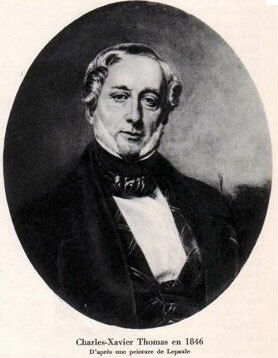 The next French national exhibition took place in 1849 and Thomas again tried his luck. On this occasion he was awarded a silver medal and the jury report devoted three pages to his machine. However, despite this higher honor, he was again eclipsed, for a gold model went to the mechanicians Maurel and Jayet for their Arithmaurel, a calculating machine with automatic capabilities, judged to exceed those of the arithmometer. A further competitive opportunity was soon offered by the 1851 Great Exhibition. But again, Thomas was frustrated. 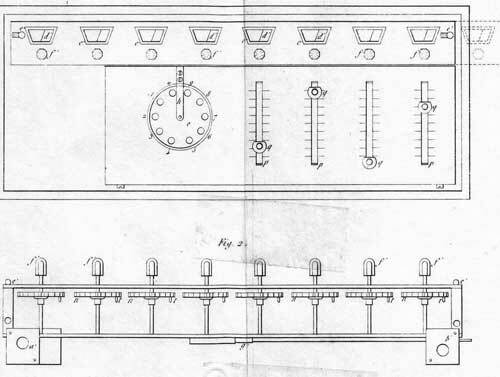 The arithmometer was one of two calculating machines to receive a prize medal, but the jury decided that it was inferior to a Russian entry devised by Staffel, originally a watchmaker from Warsaw. The arithmometer was illustrated in the official catalogue, but it was Staffel’s calculator, already successful at a Polish exhibition and rewarded in St Petersburg, which was featured in the Illustrated London News. Disappointed again, Colmar decided to prepare well for the next challenge, the 1855 exhibition in Paris. He created a giant machine especially for the exhibition (see the photo below). 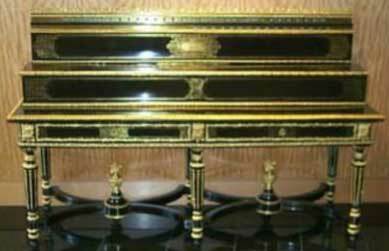 Some 6 feet long, equipped with 15 setting sliders and 30 result dials, and encased in fine cabinetwork the result was evidently meant to capture more than technical interest. And again arithmometer with no more than an honorable mention, this time the goals medal was awarded to the Scheutz's difference engine. As a whole, in his long production history, the arithmometer of Thomas received many medals, but very often has been neglected on the account of more sophisticated and advanced machines, which however will never reach market and production achievements of his rival. 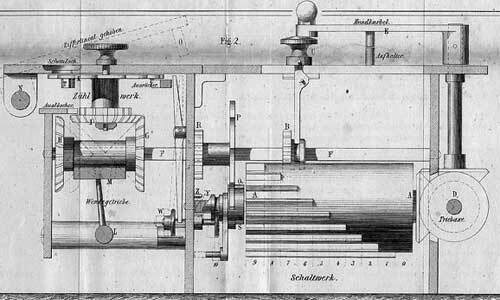 The Thomas machine was the basis of many other machines: Burkhardt, Bunzel, Saxonia, Austria, Tate-Layton, Peerless, TIM, Archimedes, etc.